I grew up in the 80s, which was a despondent time for Yankee fans. The first—and only—decade since the teens where the Yankees didn’t win a World Series. Oh, they had high profile free agents—talented guys who George always claimed was” the missing piece of the puzzle” when they signed him or traded away prospects for him. And, yes they won lots of games. But their pitching staff was a mish-mash of aging veterans and not-ready-for-prime-time kids—sound familiar? And as a result, they won a decent amount of games—again, the most games won in the 1980s—but always seemed to fizzle out come September and October. And not quite make it. But what the Yankees had wrought in me—and many Yankee fans—during those long dark years of 80s and early 90s was a healthy suspicion of any player decision having to do with the Steinbrenners or their clan. Seriously, in those days, George Steinbrenner was a persona non grata among Yankee fans. His poor free agency signing (Jack Clark) and hasty prospect trading for aging veterans (Rick Rhoden, Ken Phelps) was legendary. In other words, if a decision was not made by a genuine “baseball man” GM-type, but instead by the Steinbrenners or their Tampa clan, it was stupid. And that sentiment has been reinforced since the 80s and 90s. George’s suspension-fueled absence in the early 90s allowed guys like Pettitte, Jeter and Rivera to develop and not be traded for some fossil from another team. However, since 2001, George and the Steinbrenners have often overruled their GM and made rushed and ill-advised decisions since then—such as signing Jason Giambi, signing Gary Sheffield over Vlad Guerrerro, pushing Joba Chamberlain to the rotation (and effectively ruining him) as well as signing Alex Rodriguez to an albatross of an anchor of a contract until seemingly 2100. Almost of their decisions were colossal failures. That said, the Steinbrenners might not be wrong about Raphael Soriano. They actually may be right about the signing. Some people within the organization were telling friends that the divide between Cashman and the team’s Tampa operation is growing again, and even that ownership wasn’t happy with some of Cashman’s recent moves. Last winter, Cashman traded for Javier Vazquez, Nick Johnson and Randy Winn as free agents, and none of those moves worked out well. There was even talk that Cashman had mishandled the Lee negotiations by showing too much patience, rather than pushing to get a deal done quickly. And you know what.....they are not wrong. Now let me clarify, I generally agree with Brian Cashman and disagree with the Steinbrenners. I generally am I believer in patience, letting prospects grow, and generally distrustful of big free agent signings. All things the Steinbrenners (and their ilk) generally eschew. Generally speaking, Cashman has been a voice of reason among that crew. Cashman is still excited about the trade that brought Weaver to the Yankees last July. Make that his trade. Since the Yankees lost the World Series in 2001, the principal owner, George Steinbrenner, has orchestrated many roster moves. Raul Mondesi is here because of Steinbrenner. So are David Wells, Hideki Matsui and José Contreras. Steinbrenner wanted them; Steinbrenner got them. Weaver is here because of Cashman. It may be no coincidence, then, that the right-handed Weaver sometimes seems to be a spare part on the Yankees’ staff. His stuff is electric but his profile is low. He is not here because the owner demanded it. Really? Trade Ted Lilly, a lefty who had a 3.40 ERA in Yankee Stadium, as well as a 1.057 WHIP the year you traded him, and has been a 2-time All Star (and has been remarkably healthy, despite the fact that the Yankees traded him due to the fact that they thought his delivery would lead to injury), for an over-emotional—admittedly talented—diva, who was in no way was able to pitch in the pressure boiler that was New York. Cashman’s scouting was amazingly flawed. Yet it continued. He championed Carl Pavano so much, that after Pavano’s 4-year failure as a Yankee ended in 2008, Cashman admitted he was thinking of resigning him. Twice. The point being, that, yes, while Cashman has made some good decisions, his track record definitely does deserve some closer diligence. Does the fact that he signed CC Sabathia, Mark Teixiera and the like point to the fact that he is good GM and can find good fits for his team, or that he has the Yankee wallet to back him up? If the above examples show anything, they show that while Cashman is an advocate for patience involving prospects, rather than just using them as trading chips for aging stars—all good things—he hasn’t been the best GM in regards to scouting or value-judgment. Maybe the Steinbrenners are right. Maybe phasing him out is the right course. Look...after the contracts of Giambi, Pavano and the like cleared out in 2008, Cashman, or any ape, was free to reload—with Yankee money—and sign Teixiera, Sabathia and Burnett. Are you telling me that you, the guy reading this reading this article, couldn’t have done that? But the harder stuff a GM for the Yankee GM should know; projecting how a player might adjust to playing in New York; how a prospect might pan out; Cashman hasn’t done well. Last year, Cashman traded Curtis Granderson for Austin Jackson, a top Yankee farm prospect. Granderson had fallen in every offensive category for 2 straight years and was locked into a long contract. Jackson was the top prospect in Baseball America’s Yankee farm system. By all accounts a born centerfielder; a defensive stalwart and a natural slap hitter. So how did that work out? Jackson batted .290 his first season, was an exemplary defensive outfielder, had 10 triples, had 27 stolen bases. Granderson meanwhile, didn’t improve appreciably in any category or statistic you care to look up; and overall batted what he did the year before or even lower—.247 BA, 24 HR, 12 SB. Would you have made that trade? Look, being a Yankee GM means not only being a good judge of talent, but also, a judge of how that talent will play out in Yankee Stadium, under the hot lights of fan and media judgment. Which is why trading a lefty, like Ted Lilly who has a lifetime 2.15 ERA in Yankee Stadium, and has all the signs of a lefty strikeout Pettitte-type, for a mercurial talent makes no sense in 2004. Did Cashman not do his due diligence and check to see if Weaver could handle the Bronx? Likewise, a GM who scouts a veteran centerfielder player who declined in every statistic category for 2 straight seasons (.302 to .208 to .249BA; .38 to 26 to 23 2B; 135 to 123 to 103 OBP+) and decides to trade his no. 1 prospect for him, has to be put under suspicion—even before the fallout of the season. 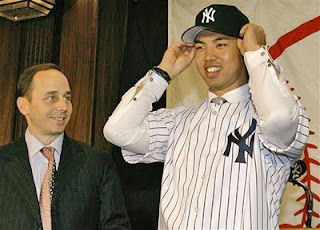 Which brings us to the Soriano signing, which Cashman was against. Well, Soriano was a lights out closer and now mans the 8th inning, which pushes David Robertson, Boone Logan and Joba to the 6th and 7th inning, creating a nice bridge for the shaky Yankee rotation. 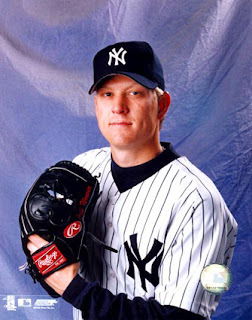 In effect the Yankees just replaced Kerry Wood’s contract for Soriano’s. Soriano, who is younger, better and can man the 9th inning should the Yankees need it. Overall, you get one of the top closers to pitch your 8th inning, for the same price as the guy who did it last year. And with extra money in your budget, why not do it—especially with the 2012 free agent pitching class looking so dim? So why would Cashman be against it? Cashman may have good intentions, and I believe he does, but his decision-making have made him more than suspect; they have made him close to failure. Should the Yankees ever have a GM with genuine prospect scouting skills—in the Yankee farm system and beyond—well, who knows, what he might accomplish? Is it time to phase Cashman out....maybe. But if not, that time may be near. You're post is not unfair. Cashman has the easiest GM job in baseball when the top free agents are available. I don't like Cashman because I don't think he knows baseball like a man in his position should. Yankees, please, can him now, before he does more damage. I hate to be so black and white, but he couldn't carry Gene Michael's jock.